GEM (or SECS/GEM) is a group of connectivity standards developed by the Semiconductor Equipment Materials Initiative (SEMI). These standards are used to define communication between automated equipment and the host's factory network enabling Smart Factory Manufacturing. SECS is an acronym for Semiconductor Equipment Communication Standard. GEM refers to the SEMI connectivity standard E30 and is defined as the Generic Model for Communications and Control of Manufacturing Equipment. In a Smart Factory, GEM is implemented on both the host and the equipment. The equipment runs software on one of its computers that must implement and comply with SEMI E30. The factory runs host software that establishes communication with the equipment's interface. In order to make use of the interface, the host system must implement the GEM standards to set clear expectations for equipment behavior expectations. 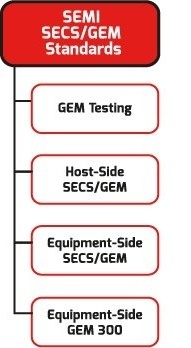 The GEM standards outline a control state model for defining the level of cooperation between the host and equipment. The equipment provides three basic levels of host control, which determine the host's ability to control and monitor the equipment. The level of host control can be specified through the user interface on the equipment. When the host is controlling the equipment, it has the ability to send commands like "START", "STOP", "PAUSE", "RESUME," and "ABORT" to control the equipment's processing. Collection events and alarms allow the host to monitor equipment operation. Collection events notify the host of equipment activity. Certain events are required by the GEM connectivity standards, but the equipment is expected to define additional events to allow the host to monitor equipment-specific activities. Alarms notify the host when potentially dangerous activity is detected and cleared on the equipment. The host determines which collection events and alarms are set up for notification. The Transport Protocol Standards define how SECS/GEM messages are transferred between the host and equipment. SEMI E4 defines a serial-based communication connection. SEMI E37 High-Speed SECS Message Services (HSMS) defines a TCP/IP based Ethernet connection. The connectivity standard, based on GEM (SEMI E30), PV2 - Equipment Communication Interface Standard for PV Production Systems, was approved in July 2009 for the Photovoltaic Industry. You can learn more about this PV2 Standard on our Photovoltaic technologies page. Cimetrix offers a GEM300 software development kits called CIMConnect™ (equipment solution) and HostConnect™ (host solution). Our product documentation, training, working examples, and world-class support make our products easy to use to implement the GEM standards.